Radiant Forties | One woman. Very little time. Where did I leave that radiance…? One woman. Very little time. Where did I leave that radiance…? My sister has just written her first novel, a romance novel set in medieval Scotland. We’ve been discussing genre writing, and she introduced me to the concept of the ‘cozy mystery‘. I love crime fiction, but I tend to like my protagonists flawed, my settings dark and my crimes a bit twisted. I love novels that have a political message and reveal something of the human condition. My favourites by a long shot include Andrea Camilleri, Jo Nesbo, Henning Mankell, Maj Sjowall & Per Waloo, Arne Dahl, Gianrico Carofiglio, Michele Giuttari and Ian Rankin. I do occasionally read books that fall under the ‘cozy mystery’ banner – by Alexander McCall Smith or Colin Cotterill, for example – but most of the books I read in this genre are blisteringly dark. When I sit down to write something non-academic, though, I can’t write like this (and not just because I have barely a whisper of the talent that these writers have!). I get through my ‘darkness’ through my academic writing, which is about the darker side of state-society relations, and when I’m off-duty, this girl just wants to have fun. And so my sister introduced me to the cozy mystery. I read very little American fiction nowadays, despite having spent the first 25 years of my life in the US, and I don’t have any favourite US crime writers. I toured the cozy mystery section of Barnes & Noble as a complete novice, sure only that I have my limits when it comes to ‘cozy’. I definitely didn’t want Christian and cozy. I didn’t want peach pie baking and cozy. I didn’t want poodle-breeding and cozy. I mean, seriously. I finally settled on Sally Goldenbaum‘s Seaside Knitters series. Set in the North Shore of Massachusetts, just south of where I was born and where I lived very happily for five years before moving to the UK, the series follows a group of women of a range of ages who meet up once a week for a knitting club and end up solving murders. (yes…I am perfectly aware that there’s the finest of lines between knitting books and pie baking books…) I like all of the characters, and the murders are often pretty dark, if not graphic. But the cozy comes through in the setting, which takes me right back to my own time living in a little cottage on the North Shore. The characters are fairly affluent, and so there’s an appeal in their gentle, middle-class lifestyles, filled with good food, original art, charity work and beautiful wraparound decks for drinks parties, particularly as – in good New England fashion – no one is very ‘showy’. And then there’s the knitting. Sometimes the knitting metaphors get in the way and have clearly been placed in order to fit the genre, but I closed the first one that I read (‘Moon Spinners’, third in the series) and went straight away to get my plastic tub full of yarn from the garage. I like crocheting, not knitting, but the effect is the same, at least in terms of well-being. In the last month, I crocheted a scarf for my daughter, and am about a quarter of the way through an absolutely gorgeous blanket. Instead of spending the last couple of hours at the end of the day in front of the tv flicking around on my iPhone, I’m crocheting my beautiful blanket, something that will hopefully become an heirloom. I’ve made my way back into the local yarn shop, and I’ve not been able to resist buying yarn already for my own winter scarf, which will come after this blanket is done. 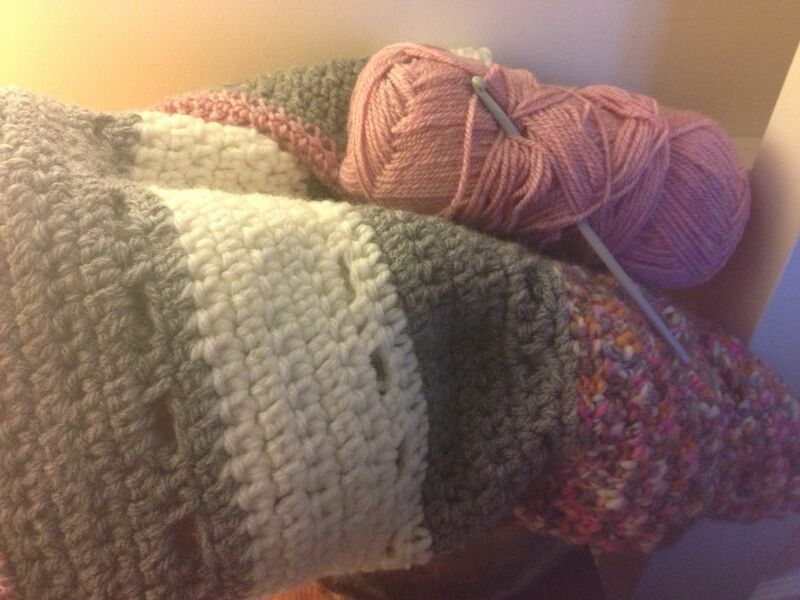 As far as hobbies go, crocheting is tactile and soft and warm and colourful and soothing and, let’s face it, cozy. I may be no closer to penning my own first novel, but at least if I do continue on with it as a winter project, I’ll be able to do it lying under my own handmade and very cozy blanket. So what’s in an adjective? Adjectives I’d like to people to be able to use to describe me in a year’s time – radiant, vibrant, ageless, light. I’d settle for ‘looks great for her age’, mind, but these would be nice! 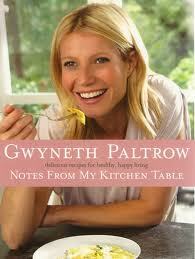 From Gwyneth Paltrow’s Notes From My Kitchen Table. Another GP recipe adapted to cut cost! I’ve also made this with dark chocolate chips, and I bet it’s good with dried fruit and nuts. 1. Preheat oven to 190°C (375°F). Line a 12 hole muffin tin with paper cases. 2. Mix wet ingredients together, stir in the dry ingredients and fold in the blueberries. Divide into the cases and bake until golden brown and a cocktail stick comes out clean, 25-30 minutes. Let cool before eating. 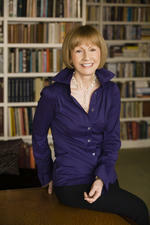 A recent read was by Mireille Guiliano, called Women, Work and the Art of Savoir Faire. I’m torn between feeling like Ms Guiliano is a tad smug from time to time (though that could be both her French and American characteristics coming through! I’ve been in the UK long enough to feel a bit suspicious of anyone who isn’t at least a little self-deprecating), and then wanting to buy this book for every working woman I know. The advice she gives, as someone who has worked her way right to the top in a heavily male-dominated industry, is sound, and is about how imbalance between work and life affects the quality of both. Some of her advice is very practical, and I’ll write more about that another time. Some of it seems somewhat old-fashioned (she is, presumably, in her 60s…albeit a foxy 60s! ), and yet I can still see the relevance (quick quiz: when you leave the table, where do you leave your napkin?). 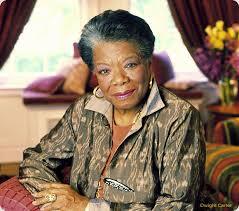 All of it is suffused with her clear passion for both her work and her life. I say ‘working women’ because it does presume that the reason why you’re reading it is because you work, and she is evangelical about the benefit of work for pretty much anyone. I have to say that I am too, so it’s a message that suits me, but I can imagine that someone staying at home to take care of their kids would find little here for her. The author did not have children herself, and so although she is aware of the challenges of balancing it all with children, it’s not something she herself experienced directly. This is not inconsequential. The reason why I have made so little time for myself in recent years is because my children – not my job really – have sucked it all away from me! I spend less time doing my job than I used to, because of my children. I spend less time on myself than I used to, because of my children. And I wouldn’t want to spend any less time with them than I do. So that means I need to figure out how to do less work, and to do what I do more efficiently, in order to find time for myself. This book is making a small contribution to helping me figure this out, and for that I’ll give it to friends who are in a similar place in their lives.